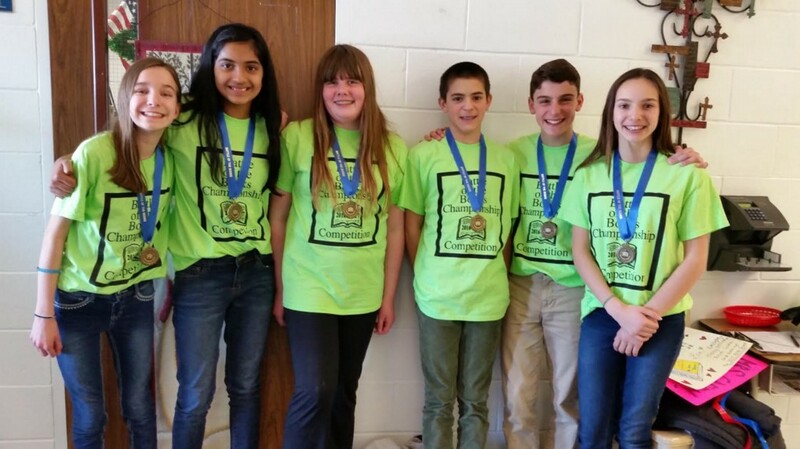 The St. Mary of the Lakes School seventh and eighth-grade team won first place in the Burlington County “Battle of the Books” held at Cinnaminson Middle School. Winners from the school level then go on to compete at the county level. From there they go to Regionals. St. Mary’s won the County Competition with over 20 middle schools in Burlington County competing and next will be competing regionally. At St. Mary of the Lakes, the students all read the same 15 books chosen by the team advisors. The competition consists of the teams answering questions about the books. They are given 30 seconds to write the correct title and author. Five points are awarded for each correct answer. Partial points are awarded for naming the correct book titles or correct author. First, second, and third place medals were awarded. Students who were on the team included Emily Murphy, Kathryn Sebastian, Emily Valentino, Luke Denn, Rocco Giegerich, Micheline Denn. The “Battle of the Books” Coordinator for the school was Mrs. Jolynn Green.